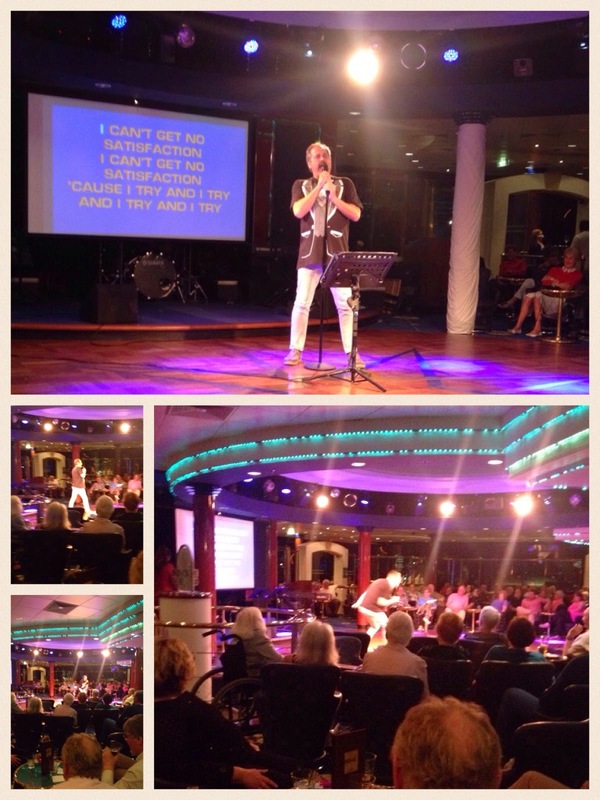 It has been 25 years since we had been on an extended Cruise Ship voyage, the reason being was that the last trip (Wanda won from work) was in a cramped cabin with a small bed, the shower and toilet were merged, the food was reception quality, and the entertainment highlight may have been a stand-up routine I performed for Talent Show Night. (Yes, that bad). We had just spent a month in Barcelona for Christmas and were trying to decide our plans for the next few months of our journey. I came across a Norwegian Cruise Line Internet ad for a 10 day Cruise from Barcelona to Morocco, Madeira and the Canary Islands and back to Barcelona by way of Malaga. The cost, with unlimited beverage (booze) and food and a ship-board credit for WiFi in a balcony room came to about $120 a day. When you add up what a flight to Morocco and the other Islands would cost, plus food and lodging, this was fantastic, plus a safer way to visit Morocco. It was also nice to stop in for a quick once-over of several locations-Islands-Ports of Call. ...and a beautiful day for a January cruise! ....We had no trouble finding all 10 of the lounges and bars - after all, we had the "unlimited beverages" pack! Pablo singing all our favorites in the Irish Pub! As far as the entertainment, the shows were using many actors with West End credentials, the show band and various lounge acts were of a very high quality, and only once did I experience a "cruise ship cringe" over a performer. The Torch singer of "Trio Royale" had a beautiful voice and Guitarist Pablo Rodriguez was incredibly gifted. Shopping in Rabat Morocco for the "All White" Party....Rich skillfully bought 2 Caftans called Djellabas for 300 Moroccan Dirham! 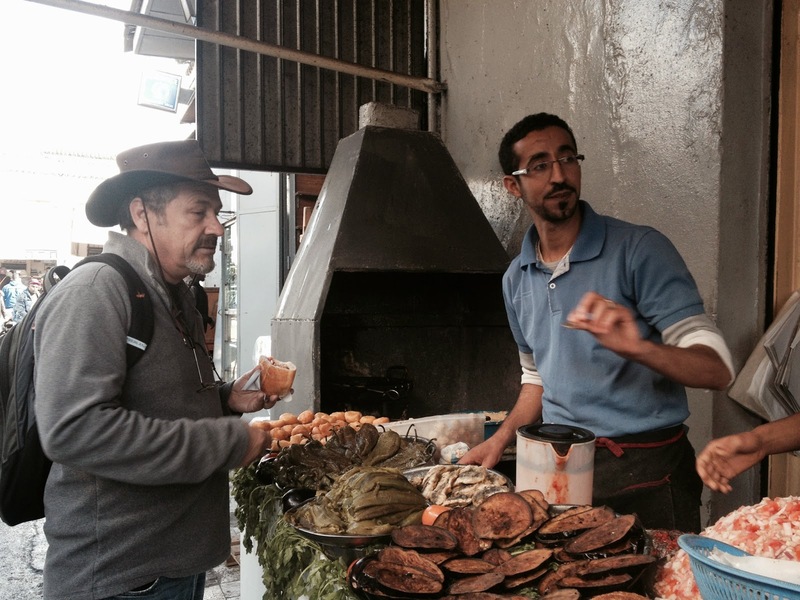 ....Of course you can't miss eating the street food in Morocco! Santa Cruz the capital of Tenerife in the Canary Islands. A trip through Timanfayo National Park and the Montanas del Fuego or the Fire Mountains with more than 100 volcanic craters - amazing tour! One of the park rangers poured water into the ground and a strong geyser of steam came spouting up - showing how hot the surface temperature is. Grapevines grown in the volcanic earth- each vine is cultivated separately and surrounded by rocks to protect them from the wind. The result is a sweet dessert wine we all know as Muscatel! Though interesting in many ways I believe we would not go to Morocco or Lanzarote again, our trip to Rabat Morocco was a great experience and included a couple of caftans and some incredible street food. We would like another shot at Funchal in Madeira for a longer stay. 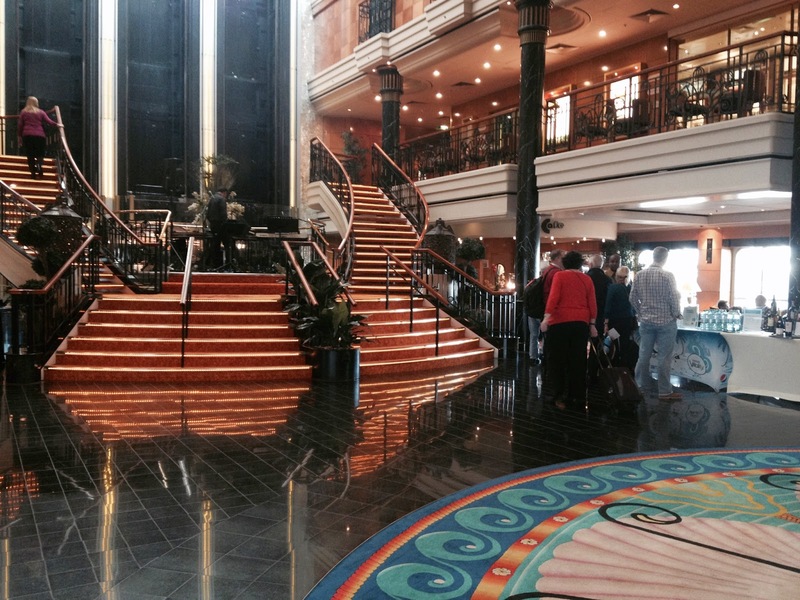 The tours you can take from the ship will vary from educational and interesting to rushed and fluff. It is hard to determine which to take, sometimes the tours are interesting, (such as Lanzarote) and sometimes it is better to explore on your own. 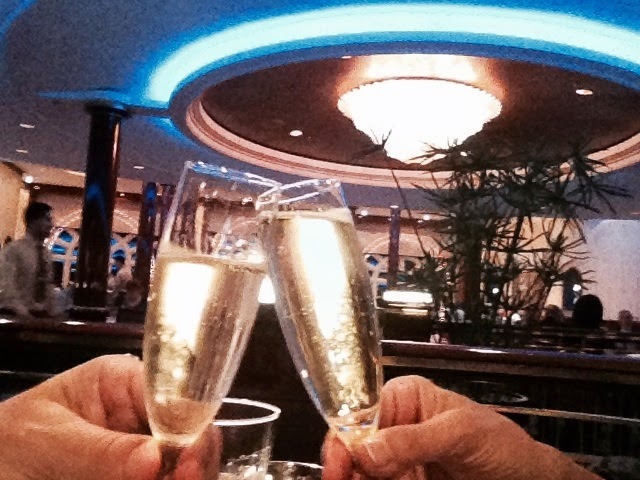 There are 14 dining options on board - and we went to every one of them!! On a nice day there are Barbecues outside - this one just happens to be paella! Attentive waiters like Mohammad! Everyone of them made sure Rich never went hungry! The dining concept on Norwegian Cruise line has advanced, "Freestyle Dining" is a chance to eat when you want and what you want with either a restaurant quality or a buffet line efficiency, plus room service. You can eat pretty much 24/7! (Please note the tight jeans and bulging sweaters, arggh) They have restaurants in the theme of French Bistro, Chicago Steak House, Teppan style Sushi, and Italian. 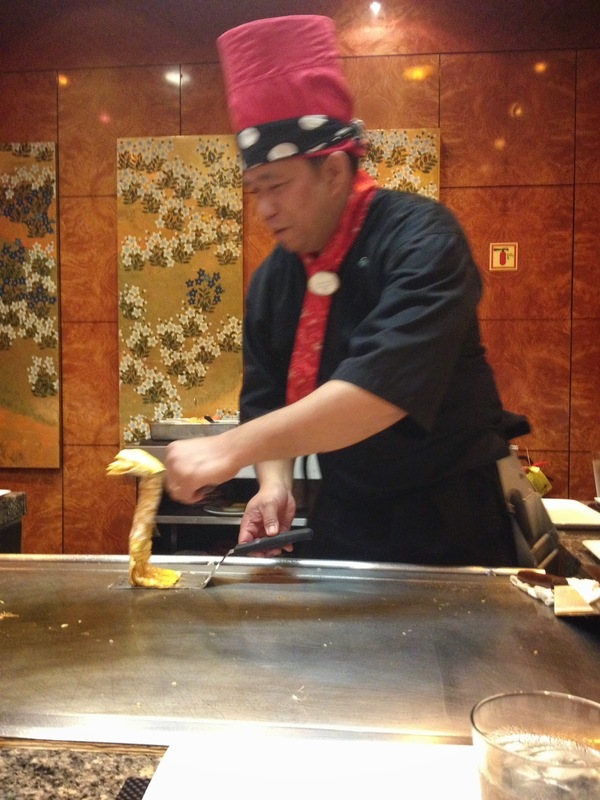 We found the service and food to reach a very high level of professionalism in nearly all variations we experienced. Is it the best food we have ever eaten? Well, of course not, but in 10 days of eating we had only a couple of disappointments, and then we just ordered another dish and it tasted great. It is odd to order 3 starters and 2 entrees and have the waiter ask if you would like more grilled shrimp, but I adapt well :-). We also found they will let you order different items and put them together as you wish, so a Caesar salad becomes a grilled shrimp Caesar! OK, funny story, I am ordering at a late-night food place - The Blue Lagoon. I start to order - chicken wings, fish & chips, Sliders, Artichoke Dip, etc.. when I notice the waiter not writing anything down. "Did you get all that?" I asked, and he replied, "Oh no, I'm sorry, I thought you were just reading the menu." Wanda has laughed for days on that remark. Lenny and Charles from the UK - the father and son team that could actually keep up with us - we spent many a night closing all the bars down. 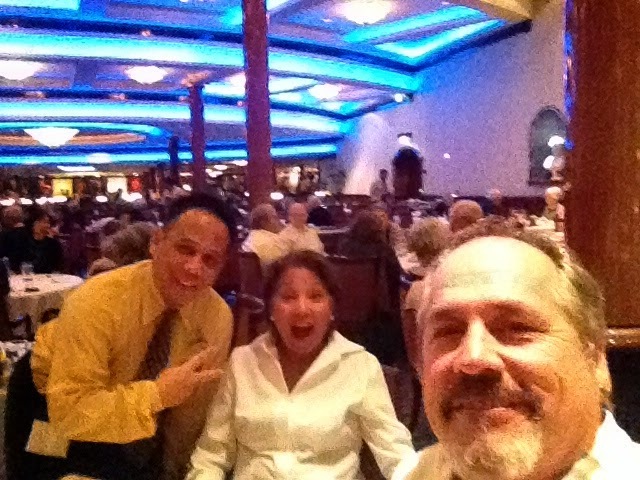 Steve and Jan from Bakersfield CA- fellow bingo winners! Mary and Craig (isn't he handsome?) 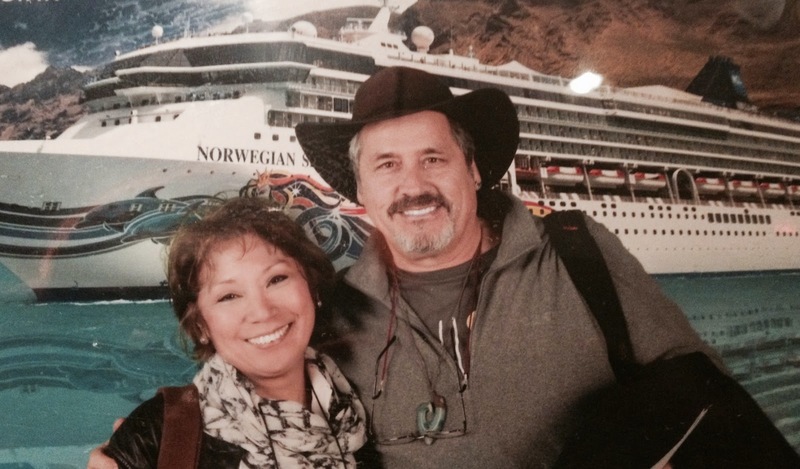 from Pennsylvania USA - these 2 people travel the world doing volunteer work, so inspirational! Special Thank You To Our favorite Crew Members!! Gary from Nicaragua our favorite maitre'd - he always made sure we got window seats at the Windows Restaurant! Yay Christine! (from the UK) the ship's acupuncturist. If you start feeling a little woozy, she is the one to go to! Thank You Francisco! 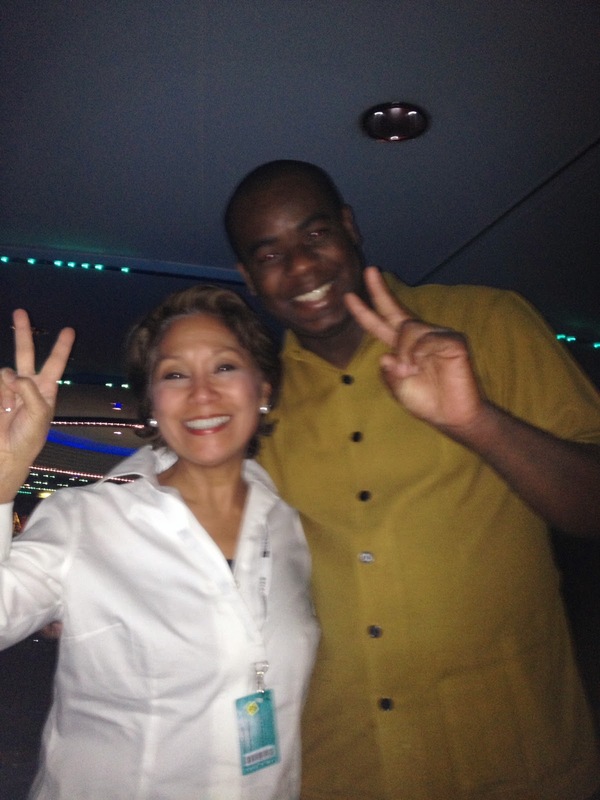 (from Nicaragua ) Francisco kept our stateroom clean and tidy twice a day and from a couple of messy people! ...and of course Karen from Germany, the most caring and professional concierge that we could ask for! Even your photographers made us look good!!! The entire crew is made up like a mini United Nations, but they work together in a much nicer way! The Wifi is charged by the minute, not a flat fee or by the megabyte as it should be. But really, it should be a good time to get off the electronics grid completely, and we did fairly well, but when you use the Internet for research and to blog, it is still a burr in the saddle to monitor your usage. So there! Will we do it again? Probably. The age of the guests (on a January sail) were a few years older than us, but we found inspiration in many of our new friends energy and enthusiasm. We were quite surprised at the food presentations. As for the ship motion sickness, Wanda did get a little woozy, but in January that can be expected. I was fine and actually enjoyed the rocking motion of the ship. As for other Cruise Ships? I am almost worried to try another Cruise Line after our positive experience. Some Cruise ships these days are enormous, I will say we were on a medium size ship The Spirit, with about 2,000 passengers, yet we never felt crowded, (OK, perhaps at 3-4 pm with so many English on board the Tea Time Buffet experienced a crush as if Manchester United were playing). However, if the price and place is right, we would go on another one. I think the Cruise Ship can be an excellent way to "taste" a few places to see if you want to go back for a longer visit. Bon Voyage!... now back to the "Road". Rich, hmm - that was only 1 negative...my negative is that I did not use the on-board treadmill to walk off all those calories I consumed and drank - oh well, as Scarlett O'Hara said, "I can't think about that right now. If I do, I'll go crazy. I'll think about that tomorrow." Cheers- a trip to remember!